CHRISTY LANE’S WORKIN’ OUT TO COUNTRY! Second Impression: She is working that scrunchie with that cowboy hat! Yeah, so my Mom saw this DVD discounted in the Fingerhut catalog or someplace, and thought it would be funny if I reviewed it. By the way, if anyone else wants to me to review a specific DVD, please send it along! This routine was shot in a gymnatorium lit by a red gel that puts me in mind of the climactic scene from Carrie. As if to distract me from the potential of deadly telekinetic powers, strategic bales of hay are placed up against the stage, as well as a cutout of an adorable burro with flirty lashes. I swear that wooden burro is looking right at me. Despite her down-home apparel on the front cover, during the workout Christy Lane sports exercise-friendly white sneaks, and peach socks co-ordinated to her outfit. Her backup dancers all wear acid wash jean shorts, cuffed to a universally unflattering length. Everyone wears pantyhose under their jorts, except for the one dude. While the live country band fiddles and twangs behind them, Christy and friends have a good ‘ol time demonstrating the Cowboy Boogie and the Boot Scoot. I was so distracted by the wall of permed bangs, that I lost track of how many times she exclaims “Yee-ha!” but it’s often. Quite often. I don’t want to go back and count the exact number of times. Please don’t make me. She’s the Monica Geller of country line dance. Like many aerobic exercise videos, there’s a pause for a pulse check. None of them ever tell you what is a good number, until now. 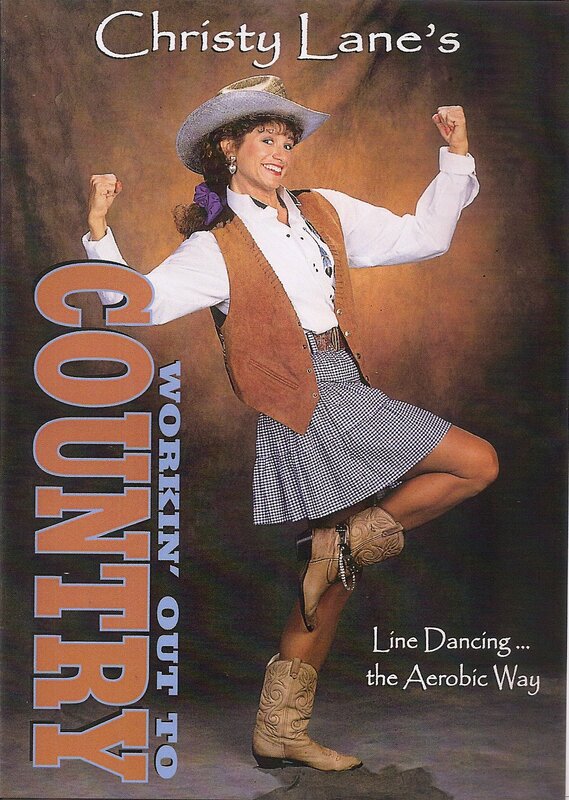 I am impressed to say that this DVD includes a feature with Exercise Physiologist Scott Roberts, who explains exactly how to take your pulse and what is the number you should be rootin’ tootin’ shootin’ for. Now I know! The most interesting thing about this video happens right at the end. While the credits roll it says “shot on location at Silverwood Theme Park, 15 miles north of Coeur D’Alene, Idaho,” and there’s footage of an old-timey Western town theme park! There’s a train ride with pretend train robbers, and a saloon, and… I want to go to there! Road trip! Who’s going with me?